Creeper is a non-hostile scamp living with a party of Orcs in Ghorak Manor in Caldera. He is one of only two non-hostile creature merchants (the other being the Mudcrab merchant). This means that, lacking Disposition and Mercantile skills, he will always buy and sell items at their base value, instead of adjusting their prices to his advantage. This makes him the ideal vendor to sell your goods to, especially considering his location; Caldera can be reached quickly by Guild Guide and is not far from Ald'ruhn and Balmora, two major settlements. While he has less gold to trade with than the Mudcrab merchant, he buys more types of goods, making him the best vendor to sell rare miscellaneous items to. "Hello Caldera!!! I'm here all week!" "Help me out. I need the money." "C'mon...help a scamp out. You gotta need something. I've got booze...."
"Don't want to work. Just want to bang on my drum. What's a scamp gotta do?" His 5000 gold is not enough to get the full value for some of the more expensive items in a single sale. See the Hints page for ways to make up for this. Creeper cannot be pickpocketed; attempts to do so will merely open his dialogue screen. 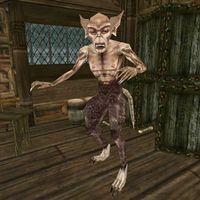 As a creature rather than a humanoid NPC, Creeper is one of the few merchants who will purchase skooma (but not moon sugar, since he doesn't deal in ingredients). He also will not buy: books or paper (other than scrolls), non-armor apparel (even magic rings and amulets), light sources, or alchemy, armorer, or thief tools. The two merchants across the street will buy all of these other than alchemy gear, which can be sold nearby at the Mages Guild. You can move Creeper to another location with Command Creature magic. Because he will fight anything that attacks you on the way, and Scamps are easily killed, you may wish to clear the path to the new location first (though remember that when you traverse cells, various hostiles in a previously cleared cell may respawn). Due to his noises, you may not wish him in your home. The central market square of Balmora is nearby, is a major crossroads for quests and other gameplay, and has a large, open surface area for dumping and sorting gear. It even provides a number of unowned containers (all the storage in Creeper's Ghorak Manor is owned and will tag your items as stolen if you use it). Creeper is Barbas, the hound of Clavicus Vile. In Clavicus Vile's Oblivion quest, Barbas says "For a while I was a scamp, making deals with Orcs". There is the possibility that Creeper's inventory can reset, i.e. all the items you have sold him will disappear forever. Don't sell him anything you aren't willing to lose. It seems to occur solely in the Xbox version, and may also affect the Mudcrab merchant. This is known to happen when the Tribunal quests are activated by speaking to Apelles Matius in Ebonheart; it is unknown what else, if anything, may trigger this bug. Creeper also appears in ESO. This page was last modified on 27 October 2018, at 04:25.